1,052 pages | 300 B/W Illus. 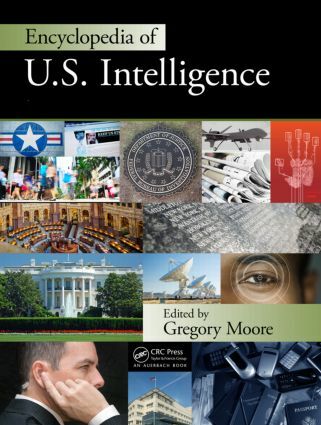 The Encyclopedia of U.S. Intelligenceis the first definitive work to chronicle the history, profile prominent figures, examine world-renowned agencies, and mark key events that have shaped the present U.S. intelligence landscape. With contributions from scholars, researchers, academics, and practicing professionals, it explores issues that reflect the public interest about American intelligence at every level from the public to the private sector. The encyclopedia covers topics related to the field of U.S. intelligence practices, agencies, and history, presented in a holistic manner that reflects both academic and applied perspectives. Going beyond a basic overview of the intelligence community and its functions, the entries offer authoritative insight on historical issues and events, significant personalities, legislation, education and training, and current information about terrorism and counterterrorism. Entries detail not only the practice and profession of intelligence within the federal government, but also criminal intelligence and analysis and the organization and activities of foreign intelligence services. They reflect the interdisciplinary nature of intelligence analysis and the variety of government agencies that make up the intelligence community. This two-volume set is a must-have reference for government agencies, research and university libraries, and individuals interested in the development and practice of intelligence in the United States. Secret Correspondence, Committee of Secret Service, U.S.
Dr. Gregory Moore is Professor of History, Director of the Center for Intelligence Studies and the Chairperson of the Department of History and Political Science at Notre Dame College in Cleveland, Ohio. He holds a doctorate in American Diplomatic History from Kent State University. He has been named to Who’s Who Among America’s Teachers and Who’s Who in American Education. Dr. Moore teaches undergraduate classes in American Foreign Policy, 20th Century U.S. History, non-Western history, and terrorism. He also teaches graduate classes in terrorism & counterterrorism and geopolitics. Dr. Moore has published The War Came to Me: A Story of Hope and Endurance and numerous articles, including "The History of U.S. Intelligence" in Homeland Security and Intelligence (2010). He has been a consultant for the NATO Humint Center of Excellence in Oradea, Romania, serving as a subject matter expert and coordinating editor for the COE’s publication, Human Aspects in NATO Military Operations, released in October 2014. He is also the author of the forthcoming book, Open Door Dilemma, Defining and Defending the Open Door Policy in the Theodore Roosevelt Administration, 1901-1909. His professional associations include the American Historical Association, the Society of Historians of Foreign Relations and the International Association for Intelligence Education. He is also a member of the Sons of the American Revolution, Phi Alpha Theta and the Order of the Sword and Shield.